Angklung is musical instrument made from bamboo. It’s consisted of two bamboo tubes and framed with bamboo frame. In the beginning angklung tuned to traditional pentatonic scale salendro, used as local Sundanese culture for ceremony or musician. Today angklung tuned to diatonic scale and can be played in all song as melody, rhythmic and bass. 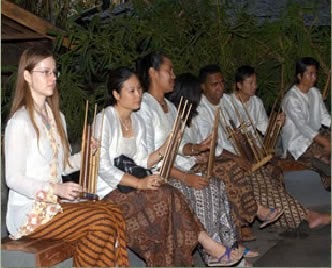 Angklung’s origin in West Java and Banten. On November 18, 2010 angklung designated as Masterpiece of Oral and Intangible Heritage of Humanity by UNESCO. It means angklung belong to everyone who lives in the world. 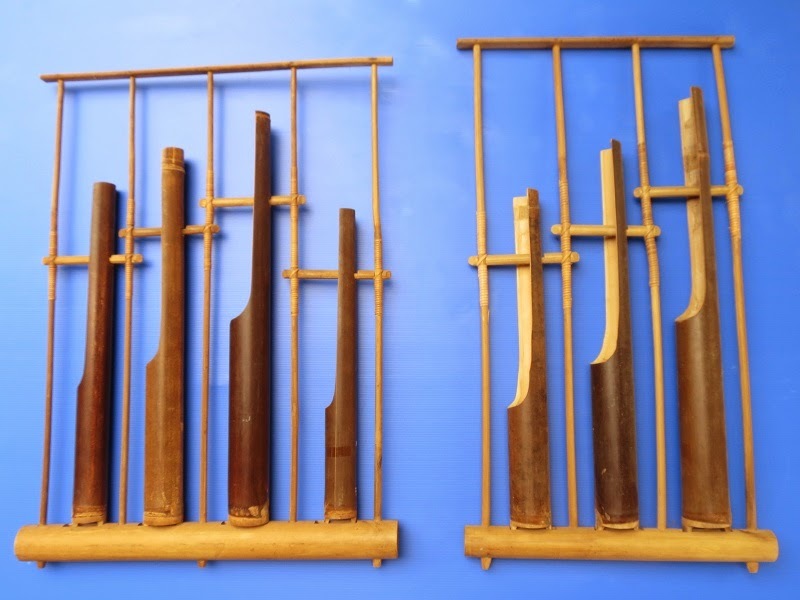 Angklung tuned to diatonic scale in 1938 by Daeng Soetigna beside of pelog, slendro and madenda scale. Today angklung almost always tuned and in chromatic scale and also can be played in several pentatonic scales. Angklung consisted of two tubes smaller and larger one. Put the larger one in your right side and the smaller one in your left. Put your left arm in the cross of middle angklung, put your left hand in the right bottom side of angklung. Hold still your left hand as a hanger, and use your right to shake left and right the angklung. You can play angklung in group so everyone can hold one or two pieces of angklung and read the music score altogether along the instructor or your friends without instructor or conductor. 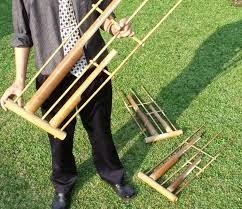 You can also play whole of diatonic angklung only by yourself, by using angklung hanger or rack. Play it as keyboard or piano from the lowest tune to the highest tune. There is only one way to sounds angklung, shake it shake it in your barehands or on hanger if you want to play solo. But remember that angklung is acoustic, it needs your patient and musical sensitivity. Now you can play angklung easily solo or group, play along with another instruments as accompaniment or your angklung switch to play chords or harmony as accompaniment.